What is the Gator Oscillator? And how do you use it? The Gator Oscillator is one of several well-known indicators developed by celebrated trader and analyst Bill Williams. 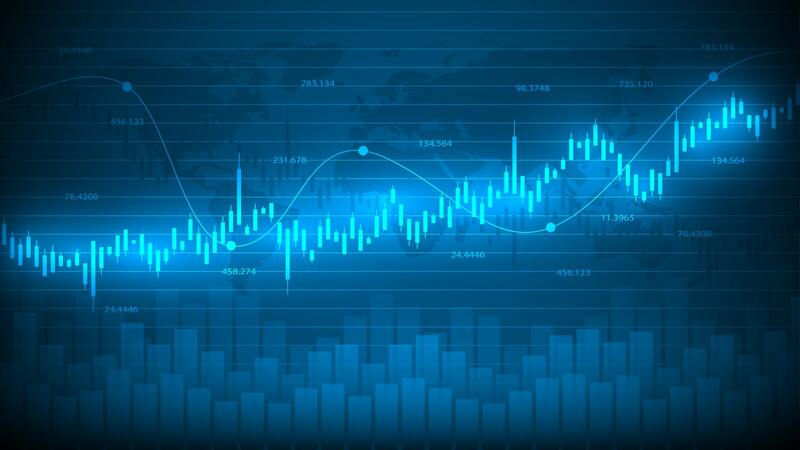 It is intended to make it easier for you to recognise when a market is trending, or when it is range-bound. As such, it makes for a useful aid in the timing of your trades. Its ideas expand on those first introduced for one of Williams' other developments – the Alligator Indicator. 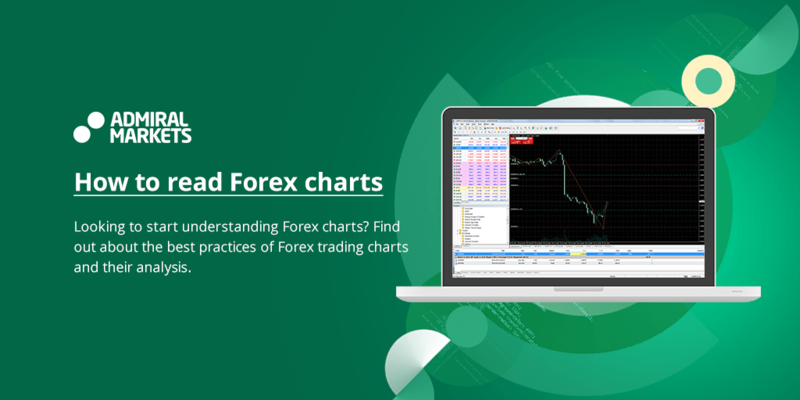 As we shall see below, we can actually set these periods and shifts to custom values of our own choosing in MetaTrader 4, but the classic values are as shown above. The Gator Oscillator formula uses these balance lines to derive values for a dual histogram — the indicator plots two histograms either side of a zero line. While the Alligator Indicator plots its balance lines directly onto a price chart, the Gator Oscillator instead displays the dual histogram separately beneath the price chart. The positive values are the absolute difference between the Alligator's jaws and teeth (that is, the blue and red lines). The negative values are calculated as the absolute difference between the teeth and lips (that is, the red and green lines) and then given a negative value, so as to lie entirely below the zero line. When a bar in the histogram is of a greater magnitude than the previous bar, it is coloured green. When its magnitude is smaller than the previous bar, it's coloured red. The bars of the Gator Oscillator are intended to make it even easier to recognise different market states compared with the Alligator Indicator. They also serve to confirm what the Alligator Indicator is showing. 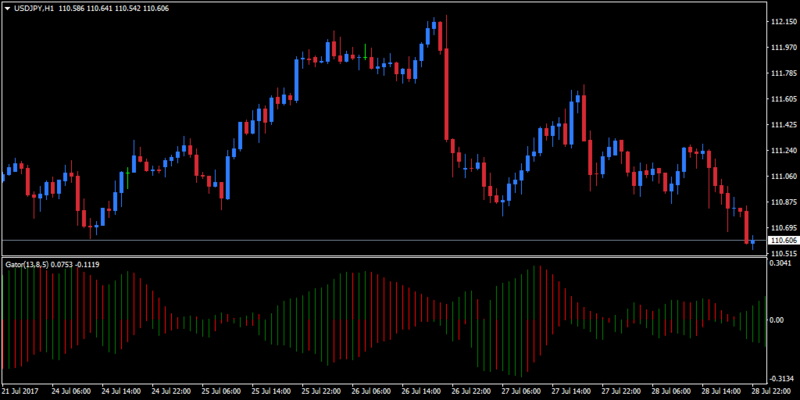 We'll discuss how this works a bit further down when we look at trading strategies with the Gator Oscillator. 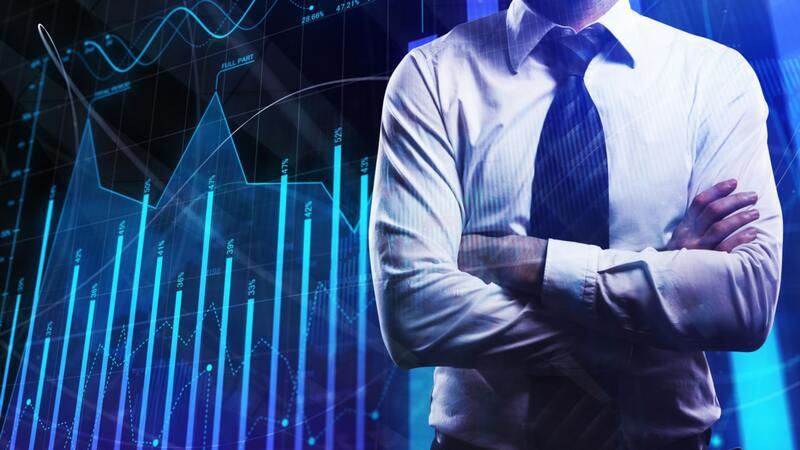 This means that you don't have to make a separate Gator indicator download; as soon as you install MetaTrader 4 on your device, you will have access to the Gator Oscillator. 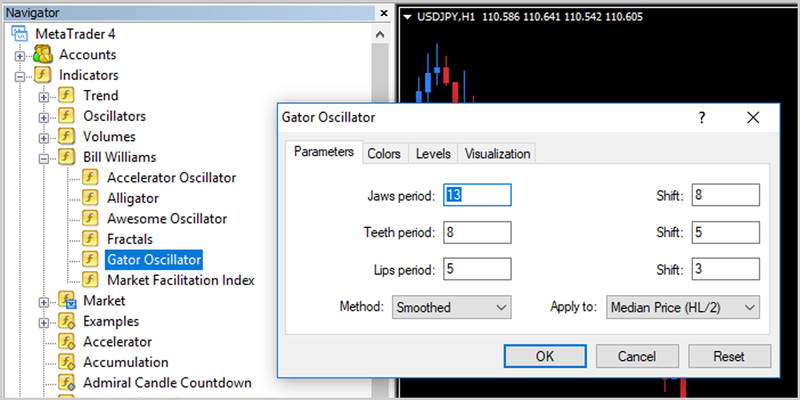 When you launch the Gator Oscillator in MT4, you have the option to set the period values for the jaws, teeth, and lips, as well as the associated shifts. As you can see from the image above, the default values are already pre-populated at the levels originally recommended by Bill Williams. If you want to go ahead with the default values, simply click 'OK'. Source: MetaTrader 4 - USD/JPY 1 Hour Chart with the Gator Oscillator applied - Data Range: July 21, 2017 - July 28, 2017 - Please Note: Past performance does not indicate future results, nor is it a reliable indicator of future performance. You can see the histogram for the Gator Oscillator plotted as two histograms beneath the main chart. For any one price bar, we have a positive value for the Gator Oscillator above the zero line, and a negative value below the zero line. But how do we actually use this to help us trade? The Gator Indicator suggests a dormant or sleeping phase when we see both bars either side of the zero line are red. In the Alligator Indicator, this corresponds to when you see the jaw, teeth, and lips are closed, closing, or intertwined. When the Gator is sleeping like this, you should stay out of the market; the indicator is intended for trading only when the market is trending. A dormant, range-bound market, Bill Williams contended, was when you should sit on the sidelines and wait. The awakening phase is indicated by different colours on either side of the zero line at the same time. This corresponds to the mouth widening in the Alligator Indicator. When the Gator has awoken after sleeping, it is hungry, and this is a time when you should be aiming to enter the market. When the indicator shows green bars either side of the zero line, it suggests the eating phase. When you see this, the trend is likely to be accelerating, and you should try to run your profits. If we see a solitary red bar crop up after we have been in an eating phase, this is a sign of a sated phase. The trend is close to running out of steam, and you should take action to exit your position as favourably as you can. When bars both above and below the zero line go red, the Gator has gone back to sleep, and the trend is over. You should once again be out of the market, and will now have to await the start of a new trend. No indicator is perfect, or even close to perfect. You've probably noted that the trading strategy above is all about timing, and doesn't give you direction. Being a trending tool, you will naturally want to be trading in the direction of the forming trend when the Gator awakens. Now, this may be apparent from simply looking at price action on the chart, but if not, you will need another indicator to aid you. This is a generally wise idea anyway, as pairing up an indicator with another can often help to improve their effectiveness. The Gator Oscillator was intended to be used with the Alligator Indicator, so that is a natural choice. The Alligator Indicator will help indicate direction, but there is no reason you can't experiment with other indicator combinations to see what works best for you. 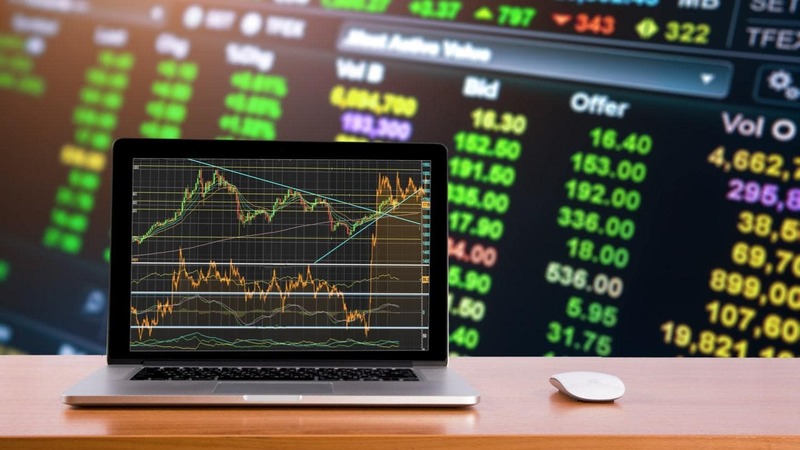 Although MetaTrader 4 comes bundled with a number indicators as standard, you might be interested in obtaining a more comprehensive selection of trading tools. If so, you should consider installing MetaTrader Supreme Edition. 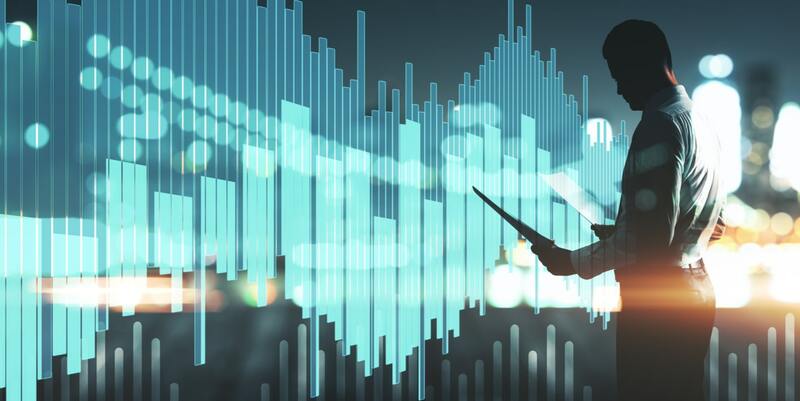 MTSE is a custom plugin for MetaTrader 4 and MetaTrader 5, designed by industry professionals to allow you to enjoy the ultimate trading experience. It offers additional indicators, as well as a variety of other cutting-edge tools. The best way to try all these combinations out is with a demo trading account. This allows you to see how your trading strategies play out with live market prices, but keeping all your practice trades risk-free. 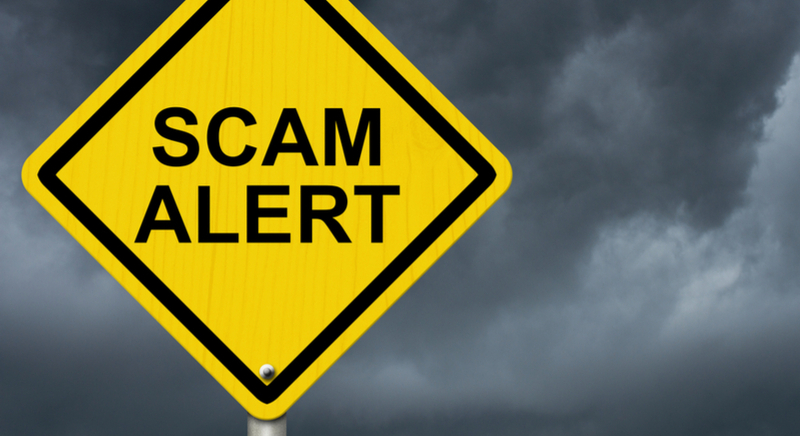 This means that you can determine for yourself what is most likely to succeed, without risking any money. The Gator Oscillator uses the convergence and divergence of the three balance lines from the Alligator Indicator to help you identify new trends. It also aids interpretation of how such trends are progressing, and when they might be coming to an end. You should bear in mind that the balance lines used to represent the jaws, lips, and teeth of the Alligator Indicator, from which we derive the Gator Oscillator, are moving averages. As such, there is inherently some lag involved in the signals provided. The Gator Oscillator, nevertheless, can be useful for distinguishing when to trade, or when to be patient and sit out until a better trading opportunity arises. It's most effective for trading strongly directional markets, as this is the condition for which Bill Williams intended it to be used. We hope that you've found this to be a useful introduction to the Gator Oscillator, and we wish you the best of success in your trading going forward!